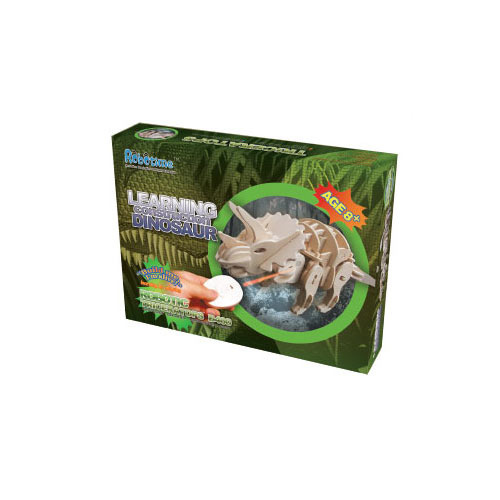 A world first in 3D puzzle technology, this clever creatoin brings the world of dinosaurs into the 21st century! With innovative features such as light sensitivity, the Robotime Triceratops reacts to the sounds around him and has a mighty roar! 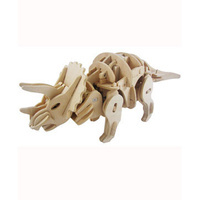 This build-it-yourself remote controlled Triceratops has more than 100 pieces and has no need for glues or screws. Each dinosaur comes prepacked with infrared modules, control boxes, motors and prestamped wood that connects easily to create your robot dinosaur. 1. Three modes of play: Free mode, demo mode, remote control mode. 2. Three control methods: Remote control, light control, sound control. 3. Remote control functions: Forward, turn left, turn right, roar, bite. So discover more about these majestic reptiles and reap the rewards of watching your own pre-historic creation come to life with the Robotime Triceratops! Approximate Dimensions: 40cm (L) x 20cm (H) x 10cm (W). 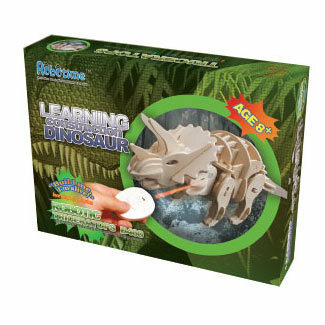 Also in the Robotime range: Robotime Stegosaurus, Robotime T-Rex and Robotime Apatosaurus.